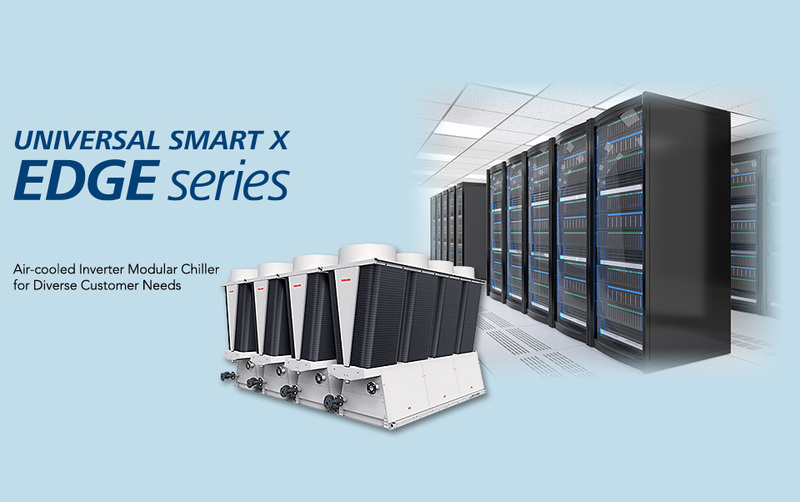 Universal Smart X Edge —— an air cooled chiller system which offers new functions with the world's highest class of DC inverter twin rotary compressor. Flexible system control of up to 8,960 horse power meets your various needs. Improving system performance with the installation of a newly-developed high-capacity DC-inverter rotary compressor—the largest in its class. With optimum tuning of the compressor and adopting a highly-improved design of a heat exchanger and refrigerant cycle, UNIVERSAL SMART X EDGE has achieved high efficiency IPLV 6.4*. As of December 2016. 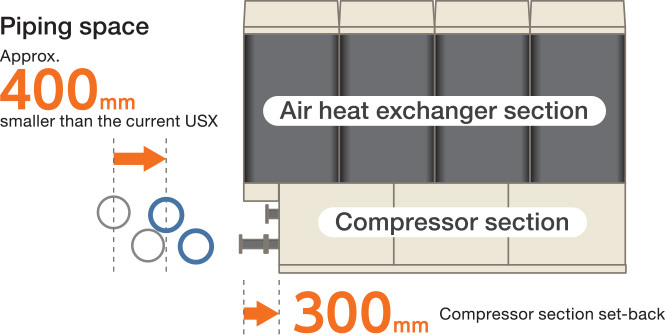 According to a study by Toshiba Carrier on AC heat-source pumps (AC-style chiller). 60HP model. The indicated value for IPLV (cooling IPLV) is based on the AHRI550-590 'Water Chilling Unit'. 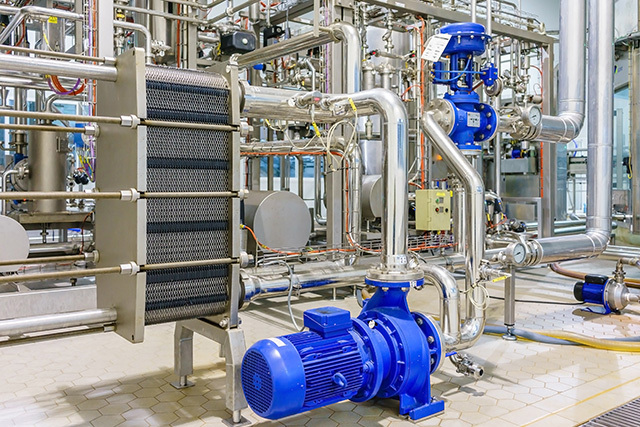 In addition to the X Frame, which also has features of our module-type chiller, a unique Edge shape has been adopted to make the piping space more accessible. Through the adopting of Edge shape in the compact design, the piping space has been reduced by 400mm smaller than the current UNIVERSAL SMART X, and the workability and serviceability have been improved. The foundation base area has been reduced to 1000mm x 3000mm, and can be easily adapted to overhauls. 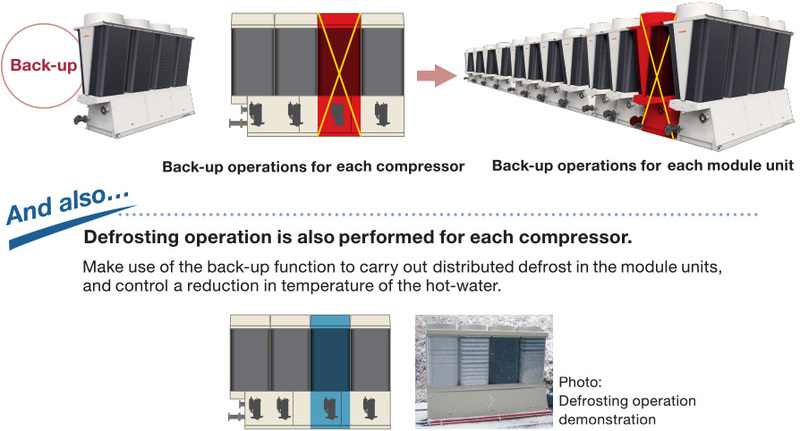 Adopting UNIVERSAL SMART X EDGE modular type chiller can avoid risk of system shut down or sharp capacity decrease at the time of unit trouble or maintenance work. Furthermore, capacity drop risk can be minimized because each module unit has four independent refrigerant circuits. Electrical harmonic current suppression function comes as standard. Reduced costs by eliminating additional installation for the harmonic current suppression! 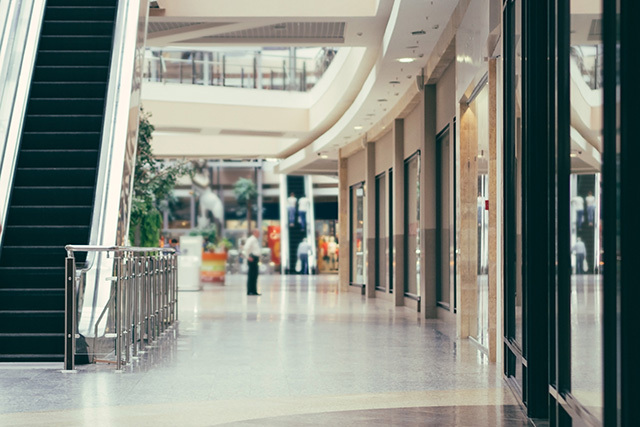 This improvements brought power factor up to 99%. 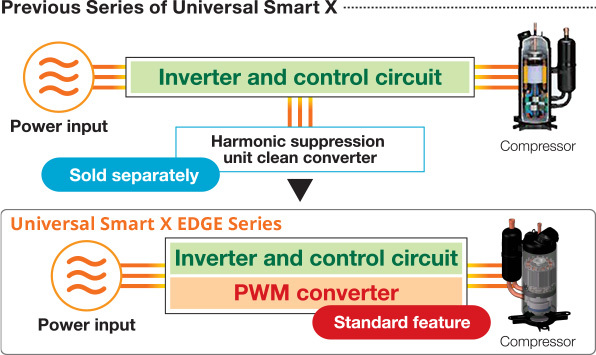 Up to 128 UNIVERSAL SMART X EDGE series module units can be combined and operated together. 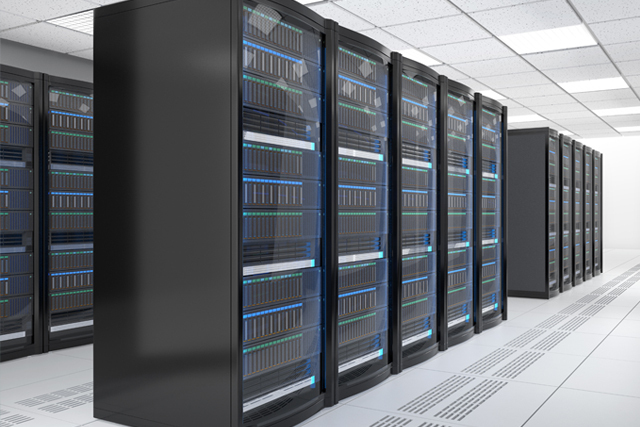 Module-in-module function reduces the shutdown risk. A DC twin-rotary compressor allows long-hour operating (24/7) at high efficiency.